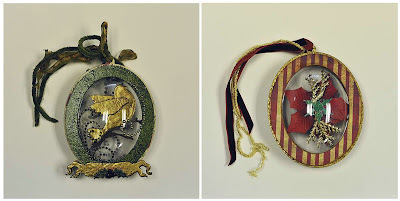 We had a great time on the Handmade Holiday Blog Hop! A big THANK YOU to everyone who came by to see us and welcome to all our new Followers and subscribers. And, thank you for all the wonderful comments on our products. We're so glad you found us and enjoyed our projects and products. Stay tuned for the prize winners announcements later this month. There is still time to visit blogs you may have missed on the HOP. Visits and comments can be left through Nov. 27. Today, we'd like to share some ornament designs with you that some of our local scrapbook store owners designed. You'll find this Designer Challenge in the Winter 2012-2013 edition of Michigan Scrapbooker. Each designer received a G&P Ornament kit, Holly Piccolos, Vintage Gold and Mossy Glen Enameling Powder, and Glastique Finishing Glaze. 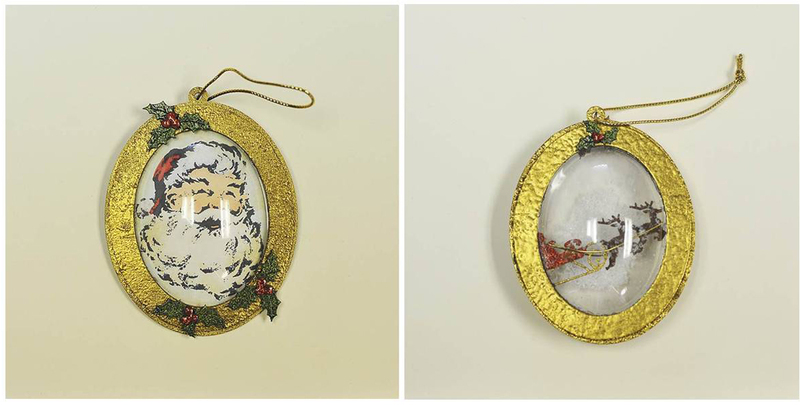 They put their creative talents to work to make these very special holiday ornaments adding in other products as they desired. We think they look wonderful! What do you think? First up is Cathy Schafer and Cindy Shearer, owners of Altered Art Addicts in Jackson, Michigan. 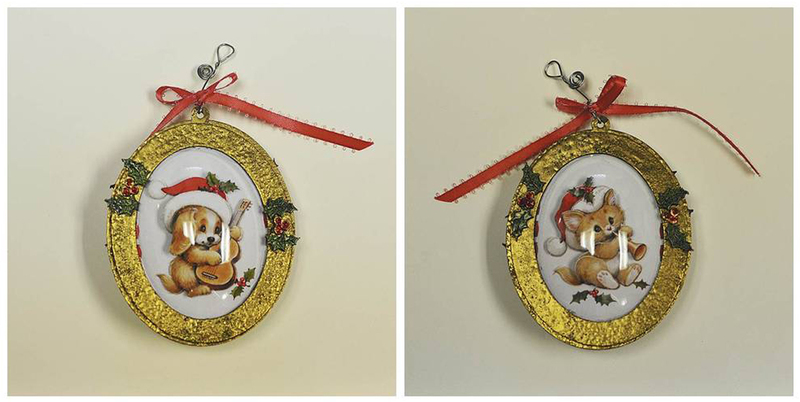 These puppy and kitten ornaments are so cute! Next, we have Roxanne Taylor-Barrera, owner of Trinkets, Baubles & Bling in Midland, Michigan. Wow, that bird is stunning! Then, we have Jan McKee who is the owner of Scrapbookers Hideaway in Millington, Michigan. Don't just love that jolly Santa! Our G&P ornament kits comes with laser shapes already cut inside (so all you need to do is paint, ink or enamel) or blank, so you can add items of your choice. A great little project to do with a group of friends or with your kids - quick and easy! Looking for a quick little gift idea? 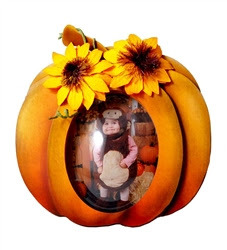 Our Pumpkin Bubble Frame Kit for wallet photos is fits the bill and, it's on sale! This is a great opportunity to create a quick and easy gift for someone special! Order yours now! Enter now and you could win this adorable pop-out Pumpkin Card Frame Kit that's perfect to display or give away wallet-sized pictures. 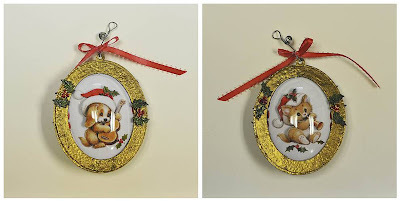 The kit is a fun, pop-out card frame with a Victorian-style bubble dome. Each bubble-frame kit includes 100-lb. cardstock frame set, clear photo bubble dome, display stand and black foam squares for spacers. The finished project is approximately 4 7/8-inches by 4 5/8-inches x 1/2-inch. Assembly is quick & easy! Visit our website to see all the adorable pop-out card frames we have on sale right now: teddy bear, cupcake, soccer ball, basketball, football, and more. WOW you're in Michigan? Me too. We are in Grand Rapids...how far away from you? Thanks for showing off the little globe decorations. So cute!!! The company is based in Midland! Elena, we're just a couple hours north of you in Midland (like Linda mentioned). You'll have to visit our factory some day!